Gmail is the most popular email service used by more than 400 million users. The service was launched back in 2004 by Google and offers various interesting email features with enhanced security. Although Gmail has so many features, still hackers manage to hack Gmail account of people and gain access to their sensitive information. Most of the people blame Google and Gmail team for this, but the fault is from users’ side. Yes, You wouldn’t believe that users are hacked because of their own fault. Gmail has implemented many interesting security features which make it harder to hack an account. In case your account is hacked, you can still manage to recover it with various recovery methods. But the black side of Gmail is that 70% users still does not know how to use these security features and put their account at risk. In this post, we will see few must-follow tips to protect our Gmail account. You must use all account recovery options. Go to Gmail security page and activate all security options. Add alternate email address, recover email address, security question and a phone number. Although, hacker can change these options after getting access to your account with password. But most of the time these security options help users to get their account back. Like a smart password, you must also use a smart security question. Most of the time hacker guess the answer to the security question and change the password of victim’s Gmail account. So try to use a security question whose answer is only in your mind. I remember my first Gmail hacking when i guess the answer of a security question. This is the most important thing you must follow to make sure you are safe. Hackers use phishing to get the passwords of innocent users. So you must check the URL of the login page. It must starts with https://google.com. Make sure it is not g00gle or go0gle or anything similar but not google.com. If you going to use Google connect then you must be extra protective. If you are already login to Gmail or any other Google service, Google connect will not ask password. And if it does, check the login URL again. Read How to detect Phishing pages and protect your password. This security feature gives strength to your Gmail security. After activating this feature, Gmail will send you a secure code to your phone every time you want to login in your account. In case your password is compromised, the hacker will also need to know the secure code to get access to your account. Setup of the feature is simple. Visit the setup page and follow simple steps. Sometimes, hacker hacks your account and add email forwarding to get a copy of your emails. This is called email hijacking when hacker adds its email address in your email forwarding. Visit Settings and then “Forwarding and POP/IMAP” tab. Here check in forwarding section. 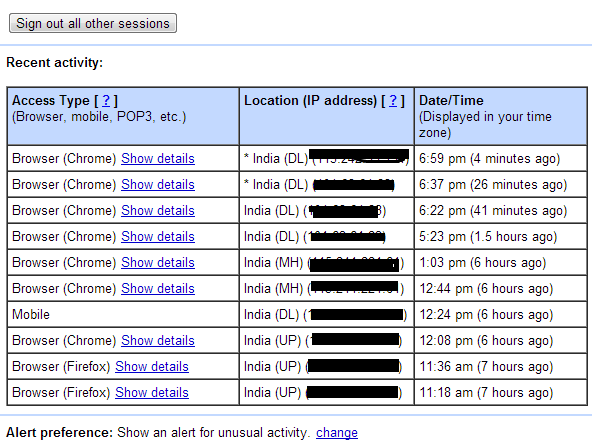 Gmail has a section where you can see last activity of your account with device and IP address. Here you can check if someone else is using your account. To access your account activity, scroll down to the bottom of Gmail page and click on details to see full activity report. On the Internet, there are many web apps which use OAuth login and access users’ account details. Most of us never care about these apps but it can be harmful. See all apps that have access to your Google Account. If you found any app suspicious, you must revoke access now. 9. Use Browser Security Plugin and Good Internet Security. To make your web browsing secure, you should also use some antivirus ad internet security tools. There are few nice security extensions that help you to identify malicious websites. Use some internet security tools ad update your antivirus on regular basis. use genuine products and never run after cracked tools ad patches. Password must be secure and private. Never share it with anyone in any case. There are so many people who share their password with their friends and other people close to them. But this can be harmful to your account and your relation both (you know what I mean). Password sharing should not be the sign of trust. Keep your password up to you. If you do your best to prevent a hacker, chances of being hacked will be very low. So, you must follow all security tips given above. If you know few better tips to secure Gmail account? Feel free to share with us via comments.